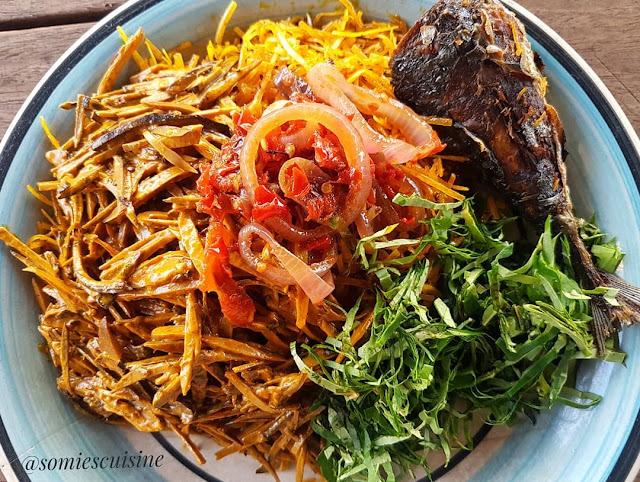 Abacha – African salad is a popular native food in Nigeria. It is fondly eaten by the Igbos – the eastern part of Nigeria. It has a natural taste from distinct natural ingredients used in making it. There is no preservative or colouration in making Abacha. The making ingredients make this food a balanced diet, especially when served with assorted pomo or fried fish. 1 teaspoon of ground dry pepper. 2 tablespoon of ground crayfish. 10 pieces of cow skin (pomo/kanda). 4 tablespoon of palm oil. 1 tablespoon of dry scent leaves. 1. Peel the cassava and cut into half and boil for about 50 minutes. 2. Slice the cassava into long thin pieces and wash.
3. Soak in the water again for a day to ferment. 4. Wash thoroughly the sliced cassava. 5. Ferment overnight and wash again. 6. Put little water in a bowl. Add little potash and ehu and stir until it turns yellowish paste. 7. Add pepper, salt, crayfish, scent leaves, palm oil, spicy, sliced ukpaka, sliced cassava and turn properly. 8. Served and garnished with sliced onions, garden egg, fried fish, pomo/kanda.